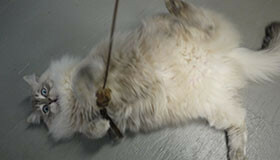 We are an exclusive, cat boarding hotel situated in West Saanich. Clean and safe facilities for both indoor and outdoor cats. Quiet, rural setting yet only 20 minutes from downtown, ferry and airport. Interactive play area with rotating “out of enclosure” time. 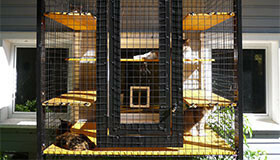 A variety of townhouses, lofts, and outdoor catio enclosures depending on your cat’s needs. Reasonable rates with multiple cat and long term considerations. Pick up and delivery offered at a reasonable charge from the greater Victoria area.